In this day and age, when you can buy a roast chicken in every supermarket, why would anyone bother going to the effort of cooking a fresh chook at home? I mean, who has the time to cook at home when the supermarket option is so quick and healthy, right? And the fact that it’s been sitting under the heat lamps in the deli section on the bain marie since 4pm that day surely won’t mean it will be dry and tasteless by the time you get it home, right? 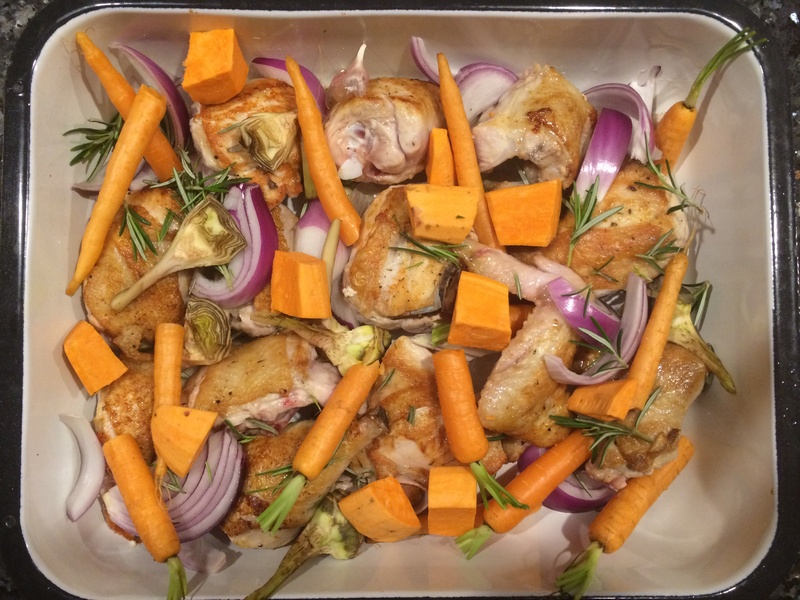 What if I told you, you could make a fresh, healthy and succulent roasted chicken at home without having to wait the 2 hours it normally takes a chicken to roast? Well, I’m telling you, you can! The brilliance and simplicity of this cheat’s chicken dish is that instead of cooking the bird whole, you cut it into smaller pieces while it’s still raw and smaller pieces = shorter cooking time. We also seal the meat in a pan before it goes into the oven. This also shortens the cooking time and means you still get that golden crispy skin you get from oven roasting for a long time. Speaking of skin, I know there are two very distinct camps when it comes to this. Whether you like to eat you’re chicken with or without skin, I recommend you leave it on for this cooking process and then do as you will once it’s on your plate. The garnish for this dish is really any in-season vegetables that you love, which are simply roasted on the same tray as your chicken once it goes into the oven. I chose to use dutch carrots, artichoke hearts (très delicieux! ), sweet potato and red onion. Cut the chicken into smaller pieces (about 12 or so) with a sharp knife. Season your chicken pieces with salt and pepper. Place a large frying pan on medium heat and place a small knob of coconut oil into the pan to melt. In the meantime, start prepping your veggies. The shape is really up to you. I choose to leave my carrots whole, dice my sweet potatoes, quarter my artichoke hearts and cut my onions in wedges. With the artichoke you’ll need to take off the leaves, the little bit of fluff inside and also the green part of the stems. Once you’ve sealed all the chicken pieces, arrange them in a roasting tray and arrange the spring vegetables around it. Crush the garlic cloves with the flat side of a knife and place into the tray whole. Take the thyme leaves off the sprig and sprinkle over the chicken and vegetables. Deglaze your pan with about 200 ml of Pinos blanc or even a Sauvignon blanc. By that I mean pour the wine into the pan and let it simmer on low heat for a minute to fuse all the delicious flavours together. Then, pour it over the chicken and put the tray in the oven for about 50 minutes to 1 hour. You’ll know your chicken is ready if the meat falls from the bone when pressed gently. Voilà! Your chicken is ready! I recommend a lovely glass of chilled Pinos Blanc to go with it.